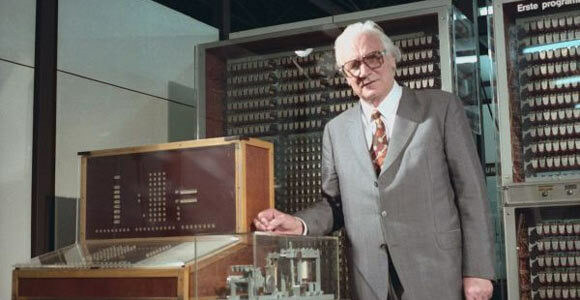 Konrad Zuse was a German engineer, widely credited with manufacturing of the world’s first programmable computer in 1938, long before the world had ever heard of such a thing. Zuse was born in 1910 in Berlin. His family moved to Braunsberg when he was two years old, where his father was a postal clerk. After attending high school, he enrolled at the Technische Hochschule Berlin-Charlottenburg where he obtained a degree in civil engineering in 1935. He was of an artistic nature and used to design advertisements for Ford Motor Company when he was a student. Zuse began experimenting with the construction of computers when he was living in his parents apartment. He invented a binary computer at the age of 28, mainly to automate the routine calculation work that he was forced to perform at his job. This was the world’s first mechanical binary digital computer, known as the Z1. It was invented in Berlin between 1936 and 1938. Mechanical computers were available at that time but they were expensive and not widely available. It had limited programming ability and was made up of 30000 metallic parts. Zuse applied for and received a patent for his device, but the computer, along with its blueprints was destroyed during a British air raid during World War II. Decades later, in 1987, he recreated it from memory but suffered health problems during its construction. It cost 800,000 Deutsche Mark (approximately $500,000) and required four people just to assemble it. The project funding was provided by Siemens and five other companies. After the Z1 was destroyed, Zuse continued his efforts independently from other leading computer companies of the day. He worked in isolation between 1936 and 1945. In the meantime he was called for military service, and ultimately managed to obtain the funding needed for construction of the Z2. This was completed in 1940 and occupied several rooms in his parents apartment. It used telephone relay technology and was an improved version of the Z1. Zuse used discarded equipment for the construction of his machine. A further improved model known as the Z3 was completed in 1941, and this was demonstrated to the public. This was the first fully operational electromechanical computer, and was partially financed by German government. Both the Z2 and Z3 models were present in a lab that was destroyed in an air raid in 1943. Fortunately, Zuse had begun construction of the Z4 by this time, which was still intact. The partially completed Z4 model was then packed and moved from Berlin on 14 February, arriving in Göttingen two weeks later. Zuse could not immediately resume work on his machine, and it was in 1949 that he showed it to a mathematician named Eduard Stiefel working with the Swiss Federal Institute of Technology, Zurich. Although he had no direct Nazi associations, he chose to take government support where he could get it, else his project would have been entirely stalled. In the 1940s, Zuse constructed the S1 and S2 models through funding given by the German government. These were special devices used to compute aerodynamics of radio controlled flying bombs. The S2 is known as the world’s first process controlled computer. Zuse later formed his own company for the construction and marketing of his machines which makes him the world’s first founder of a computer startup company. Konrad Zuse has been honored posthumously by the Computer Museum History Center in Mountain View, California for his contributions to computing and being a pioneer in computer manufacturing before mainstream computing became popular or even possible. He was married to Gisela Brandes in January 1945. His eldest son Horst Zuse is a professor at Berlin’s Technische Universität, where his father studied. Zuse died on December 18, 1995 in Hünfeld, Germany from heart failure.